If someone had told me 10 years ago that I would be forking over $160 a month to surf the web on my phone I would probably have laughed. What a silly waste of money that would be. Yet here we are, 2015, paying way to much to do just that. No More! It’s time to cut this bill in half (or more). Here is what I am considering and why. 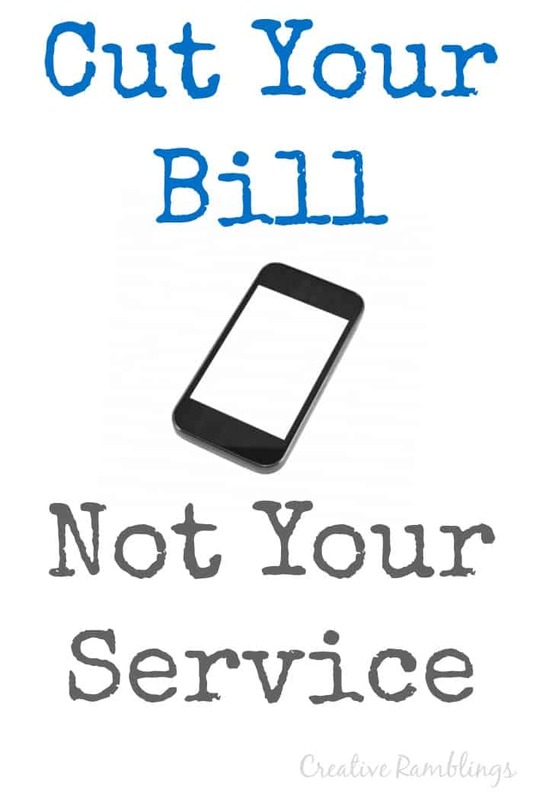 Take a look at how to Cut your cell phone bill, not your service. I live in Wisconsin and have very reliable cell service. I have no complaints with what they provide other than the price. They are even a little cheaper than the other big names in my area. We are not big on the latest and greatest technology, but want to be able to take nice pictures and use apps at a reasonable speed. We’re happy with our phones and will get new ones when these stop working. Honetly, I talk on my phone less than 100 minutes each month, but I text way more than I need too. As for data, we are always connected to whatever WiFi is available so out of that 5 GB, we each use less than 1 GB per month. Our crazy high data package came from a plan we signed up for years ago. To get that now as a new customer would be well over $200. We don’t need it all but the plan that offers 1 GB of data is still more expensive than our current plan. When it really comes down to it we do not NEED as much as we have. This is a theme in our lives lately; NEED vs WANT. As we work toward insourcing our life, simplifying how we live, this conversation happens almost daily. When we strip our lives down to our basic needs, plus a few wants, we end up with a simple fulfilling existence. Before I call and cancel all together I did some research. What is out there? The other big national companies all offer the same contracts, huge cancellation fees, pricey shiny phones, and big price tags. Not asking too much. Here are the three phone companies and plans we are looking at. I chose these based on their coverage and availability in my area. Pricing: Primary Line: $29.88, Save $5 on additional lines. Ting is different and very cool. You pay based on how much you intend to use, and you can change your plan each month. Their site is incredibly helpful and walks you through how to choose a plan. They operate on multiple larger networks offering the same 3G and 4G LTE coverage in most areas. Here is what we would choose and pay to get comparable service to the plans above. We have a lot to consider. We have a small early cancellation fee to pay if we switch now and since our phones are locked and exclusive to our carrier we would both need to purchase a new phone. If we choose to downgrade our phones we can get new ones for well under $100 each with any of the above plans. I hope to make a decision and have an update for you this Spring! Tell me about you cell phone plan. Have you tried any of these? Why did you choose the plan you have? I want to see how you #DIYYourLife? What little steps are you taking today to insource and simplify your life? Share a pic on Instagram using #DIYYourLife and tag @creativeramblings. We used to have T mobile and were paying almost $250 for my husband and my phones. We have been with Straight Talk for almost 3 years now. We have awesome service unlimited talk text and data and pay just under $98 for two phones. I am a huge believer of not going with the big 4 cell phone companies. This was a great post!! Sydney this is so encouraging, I cannot wait to switch. I think we have decided and hope to make the switch this month. Thanks so much for reading. Ting! We have been with them for years. Great service and we save a ton! That’s awesome! I love hearing that other people use them, seems almost too good to be true. I hadn’t heard of this service, but we live out in an area with limited options. To me unlimited is important as I use my phone for everything! I agree it’s important to have reliable service, I don’t know what I would do without it. Thanks for stopping by Jane. I never heard of Ting before , where I live there’s not very many choices in service carriers. I really can’t stand the phone company I have service through, sometimes I literally have to go outside and stand in the middle of the street to get reception on my phone. Thanks for sharing maybe one day I’ll have more options. Oh no Kim, that would be aweful. I consider myself lucky to have such good coverage I hope you have other options soon too! Great post…very informative! I’m curious….do you notice any difference with reception when going with any of these carriers/providers? My dad has done the T-Mobile Simply Prepaid plan for a long time and really liked it, but recently switched to Verizon and said there was a noticeable difference in reception and connectivity. Just curious how this fares. But, in reality, the most important component to consider is how much you’re spending/saving! I agree….need vs. want. While it can be so difficult, it is essential to simplify! From what I have heard in my area the reception on these plans is excellent. I’ll know first hand once we make the switch! Yes there can be some difficult decisions, but simplifying is so worth it. Great advice! Sometimes we just get locked a plan and don’t even think about changing it… even worse, when those monthly bills continue to creep up gradually. Definitely worth the time to review what you are using vs what you are paying for!! Great Article! So many people are unaware of how much they can save… and the savings really add up! We created a website devoted to helping people connect with top-tier carriers and save significant money on their monthly cell phone bill! Check it out if you are interested. Let us know how we can be of help with your blog!